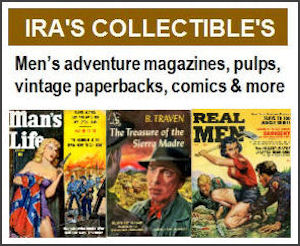 Earlier this month, I posted an entry on this blog about Walter Kaylin, the legendary men’s adventure story writer who was also editor of the short-lived, pocket-size men’s pulp magazine Brave. I am a big fan of Kaylin’s work. Dozens of his stories appear in vintage men’s adventure magazines, some under his real name and some under the pen name Roland Empey. Most of Kaylin’s men’s adventure stories are in magazines published by Magazine Management. 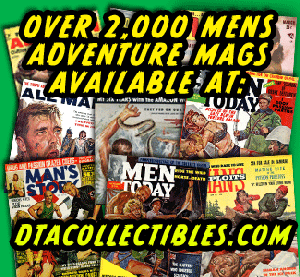 Mag Management, founded by Martin Goodman, published some of the best vintage men’s adventure magazines, including Action for Men, For Men Only, Ken for Men, Stag, Male, and Men. Walter Kaylin was a favorite writer of former Magazine Management editors Noah Sarlat, Bruce Jay Friedman and Godfather author Mario Puzo, who worked as Associate Editor for Friedman in the late 1950s and early 1960s. Then, last week, I got a surprise note from fellow Kaylin fan Josh Alan Friedman, Bruce Jay’s son. Josh is a writer and musician whose latest book is Black Cracker (a truly amazing “autobiographical novel” that I highly recommend). He’d made contact with Walter’s daughter, Lucy Kaylin, and found out Walter is alive and well and living in Old Lyme, Connecticut. Lucy, who is an author herself and Deputy Editor of O, the Oprah Magazine, was kind enough to put me in touch with her father. And, he graciously took the time to do an interview with me. Walter was born in the Bronx in 1921 and is now 89 years old. But he’s still very sharp and great fun to talk with. 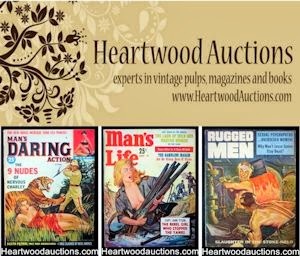 He seemed surprised when I told him that the stories he wrote for men’s adventure magazines in the 1950s, 1960s and early 1970s are considered some of the best ever written for the genre and that magazines with his stories are sought out by collectors like me. I’m still working on transcribing my interview with Walter. When I finish, I’ll post it here. 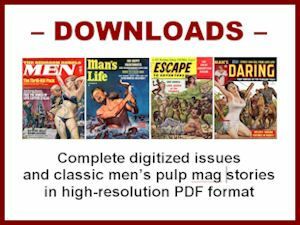 In tonight’s post, I’ll provide an example of why other writers and editors — and fans like me — consider Walter Kaylin to be one of the best of the men’s pulp magazine writers. The example I picked is his story about the ill-fated USS Indianapolis, titled “108-HOUR MID-OCEAN ORDEAL...500 DEAD...300 STILL AFLOAT.” It’s the cover story of the May 1963 issue of Stag magazine, which features an awesome cover painting created for the story by the renowned pulp art and historical painter Mort Kunstler. If you’ve seen the 1975 movie Jaws, you’ve heard a small part of the story of the USS Indianapolis. It was an American Navy cruiser sunk by a Japanese sub’s torpedoes in 1945, after delivering parts for the atomic bomb dropped on Hiroshima. There’s a well-known scene in Jaws in which Quint the shark-hunter, played by Robert Shaw, tells what happened after the Indianapolis was sunk — revealing that his obsessive hatred of sharks stems from being one of the ship’s surviving crew members. Although the sharks are part of Walter Kaylin’s story about the Indianapolis, they are not his focus. He starts the story with a fascinating scene on the Japanese submarine that sank the Indianapolis. Then he shifts his viewpoint to follow the Indianapolis crew through their gruesome three-and-a-half day ordeal in oil-covered, shark infested waters. He also explains why, after the few hundred surviving crew members were rescued, this incident led to the first court martial in history of a US Navy Commanding Officer for losing his ship in action. Kaylin’s Indianapolis story is historically based, unlike some of his men’s adventure magazine stories. But it’s written in a fast-paced, novelistic style. Now, you can download and read the entire story by clicking this link. 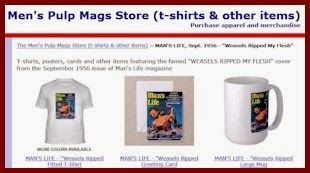 It’s another exclusive MensPulpMags.com reprint, made available with Walter Kaylin’s permission. By the way, you should also check out some of the other exclusive reprints posted as downloads on this blog. And, to learn more about the legendary Walter Kaylin, be sure come back soon to read my interview with him. I plan to post it in the near future.